Bankset Energy Corporation has ambitious plans to install gigawatts of solar PV on railway sleepers across the globe. While the first installation took place in Switzerland, work is under way on projects in Germany, the United Kingdom, France, the United States, China and Italy; and gearing up in Austria and Spain. pv magazine speaks to Bankset Group president, Patrick Buri. Bankset Energy began construction work on the installation of 200 MW worth of panels on 1,000 km of rail track in Germany, in June 2018. The U.K. renewable energy investor says it plans to cover the world’s railway network system – said to be over one million km long when added together – with solar PV panels. Bankset Energy began its journey in Bern, Switzerland, on private industrial track connected to the SBB/CFF track; and started installing 200 MW worth of panels on 1,000 km of rail track in Saxony, Germany, in June. The latter is set to be completed in 2019, and extended to 10,000 km by 2022. Bankset Group president, Patrick Buri. The company is also working on projects in the United Kingdom, France, the United States, China and Italy; and is gearing up for more in Austria and Spain, Bankset Group president, Patrick Buri, tells pv magazine, adding that either Bankset Rails Group installs the projects, or it works with several rail specialists, such as Sersa Rail Group. “Using patented technology, solar panels made of silicone and aluminium are designed to clip over existing railway sleepers. These are currently made from concrete, wood and steel – proven technologies that have stood the test of time,” read a statement from the company on the technology. Buri says Bankset uses solar cells manufactured from an unidentified producer in California, United States, while the Bankset Energy solar panel system is assembled in Europe in two manufacturing centers. “We also have a manufacturing center in Asia – China – but Bankset Energy is designed by Bankset Energy Group in Switzerland and the U.K.,” he says. Development of the technology in European factories started back in 2013, says Bankset, with €10 million in financing provided by Bankset Investments Ltd, Bankset Energy Ltd and other, unidentified, public and private investors, mainly from the United Kingdom and the United States. Another €300 million is set to be raised in a further financing round. The electricity goes into the national or local grid network. The electricity can also go to the 3 rd rail as detailed in the Riding Sunbeams report by Dr Nathaniel Bottrell Imperial College,London and Leo Murray charity 10:10 which shows how solar farms outputting at 600-800V DC can be connected directly to the 3 rd rail and overhead cables 750V DC to power trains,the tube and trams in the UK,(and Spain,India,San Francisco and elsewhere). 10:10 wants community owned subsidy free solar farms to power trains and trams.Since the UK government cut subsidies to renewables,investors can get a better rate of return from a PPA with Network Rail that is in charge of the track in Britain and Transport for London,than from the feed in tariff to the National Grid. Can charities invest in the Bankset Group solar sleepers ? 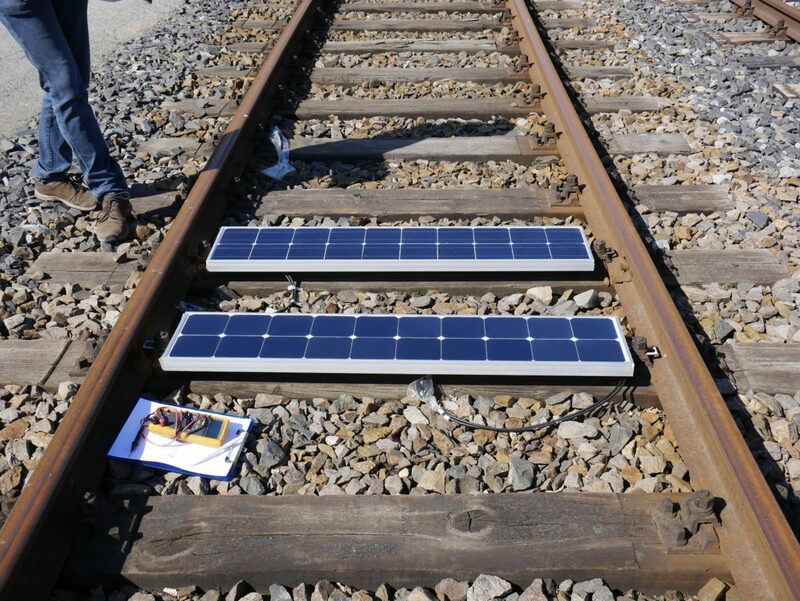 The Italian company Greenrail has also developed solar,LinkBox (solar panel with sensors) and piezo sleepers,the latter uses the slight downward motion of the sleeper as a train passes over it to generate electricity,(useful in tunnels and for the London Underground) ,15-20% cheaper with half the maintenance costs, made partly from recycled plastic and rubber from old tires. Greenrail has signed agreements with Safepower1 in the US and Indra in Spain. There is also the Bill Moyer and others Solutionary Rail plan in the USA,to upgrade the track for 125 mph high speed trains,electrify the railways with overhead cables,and install power lines above the track to connect small and large scale solar,wind and hydro including ones owned by Native American tribes to the National Grid. A solar farm has opened a few months ago,that can power directly using a new type of inverter the Ostbahn eastern railway in Austria. An old 1949 aluminum class 600 train in Byron Bay,Australia is propelled by pv panels on the roof and the batteries charged at stations from pv`s. We have the perfect scenario in Australia. The Ghan stretches from Darwin to Adelaide 5000 k.